Taylor Leier is Ready for the Change of Scenery · Let's Go Amerks! It was a shocking night last Thursday for two players on the road to find out that they had been traded. 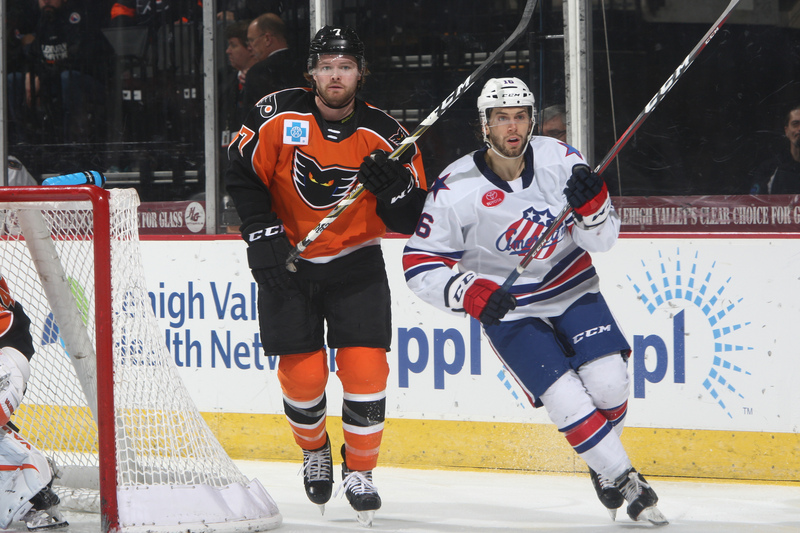 Taylor Leier was with the Lehigh Valley Phantoms in Hartford for a Friday night game and Justin Bailey was with the Rochester Americans in Wilkes-Barre/Scranton for a Friday night game. Newly acquired Taylor Leier found out while he was laying in bed in his hotel room after going out to dinner with some now former teammates. The first game in an Amerks uniform was against his former team. A standard question is to ask the coach what he knows and the player to describe his play. The next step to a new situation is getting to know everyone. Recently when Scott Wilson was assigned to the Amerks he immediately knew Kevin Porter. Leier looked at the roster and asked himself if he knew anyone. On the Amerks roster he knows of Dalton Smith from playing 11 games with him at the end of the 2015/2016 season. He also played in the 2014 World Juniors tournament with Sam Reinhart. The years spent in Allentown will have a lasting impression on Leier. The Amerks can use some help playing at home and Leier is ready for the challenge. In case you missed it, here’s highlights of nine of the 10 goals Leier has scored this season. Taylor Leier has 10 goals this season, I found clips of 9 of them. Here's a glimpse of what we could see of him in an #Amerks uniform.